We'll begin towards Pauillac. Join us on an excursion for both packages: Helicopter ride - fly over the gorgeous Médoc! Experience a bird's eye view of the numerous châteaux and famous vineyards that give the region its reputation. It's a once in a lifetime experience! **Unavailble from April to the end of June. 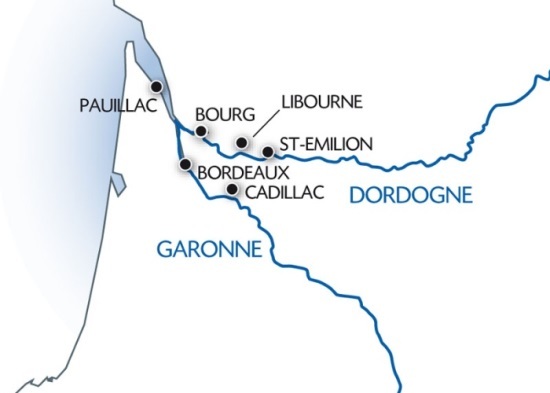 We'll cruise to Libourne, a town rich with history and full of character located at the confluence with the Isle and the Dordogne Rivers. Upon arrival, join us for an excursion for both packages: tour of Saint-Emilion. We'll return on board in Libourne. Tonight is our festive gala dinner and evening.